“Start­ing with Germano Celant’s exhib­i­tion pamph­let and cata­logue from 1972, Book as Art­work, and con­tinu­ing through examples from the 1970s, 1980s and 1990s to new pub­lic­a­tions, the show aims to present an over­view of the recep­tion of a rel­at­ively recent crit­ic­al art form. This wide vari­ety of mater­i­al, which ranges from exhib­i­tion cata­logues to artists’ mono­graphs, ref­er­ence books, deal­ers‹ lists and book­lets, not only con­sti­tutes the accep­ted sec­ond­ary lit­er­at­ure on artists’ books; it reflects the inter­sec­tion of art and pub­lish­ing, and shows how this sub­ject has been appraised and under­stood over a sig­ni­fic­ant peri­od of time. and sym­bol­ic eco­nomy of visu­al art; if this pro­duc­tion and dif­fu­sion of prin­ted mat­ter medi­ates and repro­duces art, it also often becomes an art form in its own right. Yet con­sid­er­ing a book as an art­work in its own right is not as straight­for­ward as it first seems, and the con­tinu­ously vex­ing ques­tion of the defin­i­tion of the term ‘artist’s book’ owes a lot to the ever-chan­ging nature of art’s defin­i­tion. In one respect, the func­tion of the book as a medi­um con­spires to cre­ate a mul­tiple art that claims a demo­crat­isa­tion or anti-elit­ism, yet the field is also littered with con­tra­dict­ory state­ments on the nature and defin­i­tion of the art­work. In essence, the pur­pose of this par­tic­u­lar pro­ject is to give vis­ib­il­ity to a mar­gin­al art pub­lish­ing activ­ity, as well as books that doc­u­ment and sur­vey a spe­cif­ic form of pro­duc­tion that has taken place over the last sixty years. Per­haps it is fit­ting that Desjardin’s pro­ject about artists’ pub­lish­ing should take place with­in a gal­lery in a region­al pub­lic lib­rary, a minor site where the book and art­work co-exist. 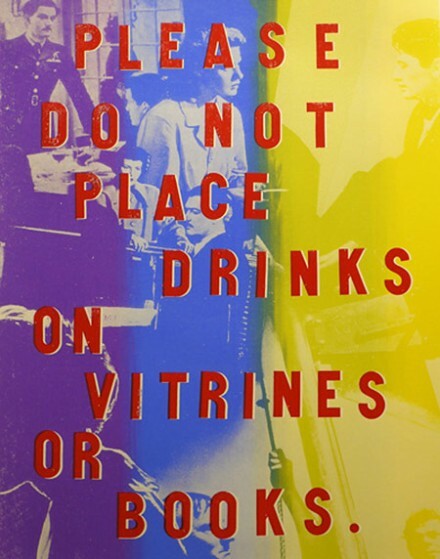 ‘Please do not place drinks on vit­rines or books’ is an exhib­tion cur­ated by Arnaud Des­jardin.